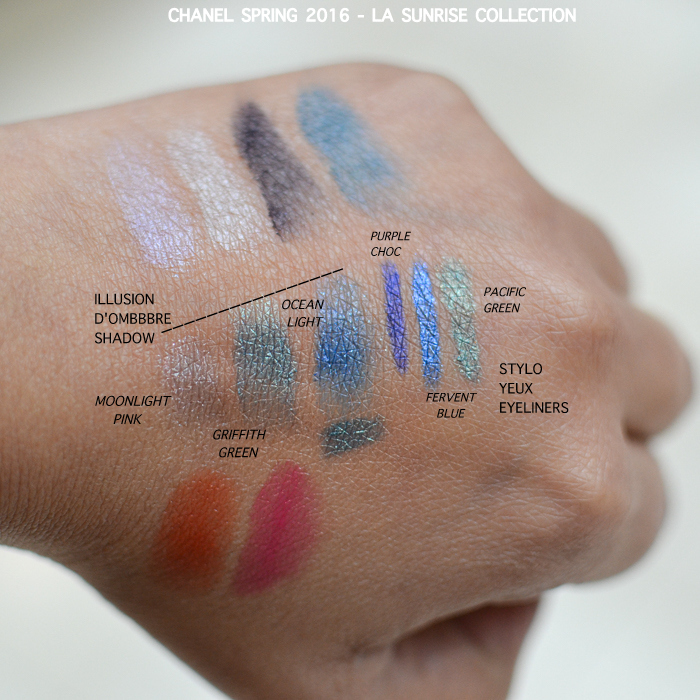 Chanel Spring 2016 Makeup Collection - LA Sunrise - hit stores a while back, and I couldn't think of a more perfect start to the 2016 makeup season than this brightly colored collection. The star of this collection is undoubtedly the Sunkiss Ribbon blush, but this relatively small collection packs quite a punch with green, blues, and purples for the eyes and truly juicy pinks and orange for the lips. Scroll on for a look at Chanel's potrait of LA. When I first saw the promo images for this collection, I figured I might like one or two of the lipsticks and yes, the nail polish, and while the blush looked beautiful, I had serious doubts about it showing up on my skin tone. Swatching it in store, I am quite impressed. The blush feels quite soft, the colors quite pigmented, and while I have swatched the colors individually, you can mix and match to create quite a few different shades/intensities to add the perfect pop of color for spring. I haven't been too enthusiastic about Chanel's decision to go with the round eyeshadow quads (when I was in India, I could only get the baked round quads, and I used to envy the soft, square versions that Chanel sold in the US), and I have remained skeptical despite the positive reviews I read online. Needless to say, I wasn't expecting much from the newest offering - Le 4 Ombre Eyeshadow Quad Beverly Hills - but for a quad with bright blue and lilac, it does seem suprisingly wearable, perhaps because the darker colors help balance out the pastels. The formula also feels much smoother and quite pigmented. The eyeshadow quad isn't the only eye makeup option in this makeup collection. 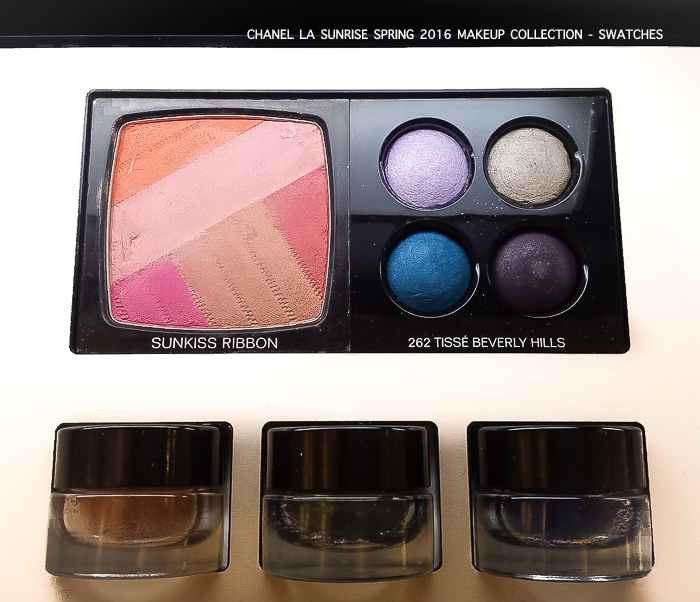 Keeping with the blue-green-purple palette are 3 Chanel Illusion D'ombre cream eyeshadow and 3 new Stylo Yeux waterproof eyeliners. The colors aren't what I reach for in my regular makeup routine, but they are quite spring-appropriate and fun colors. My favorites from this collection would be the Rouge Coco Shines. 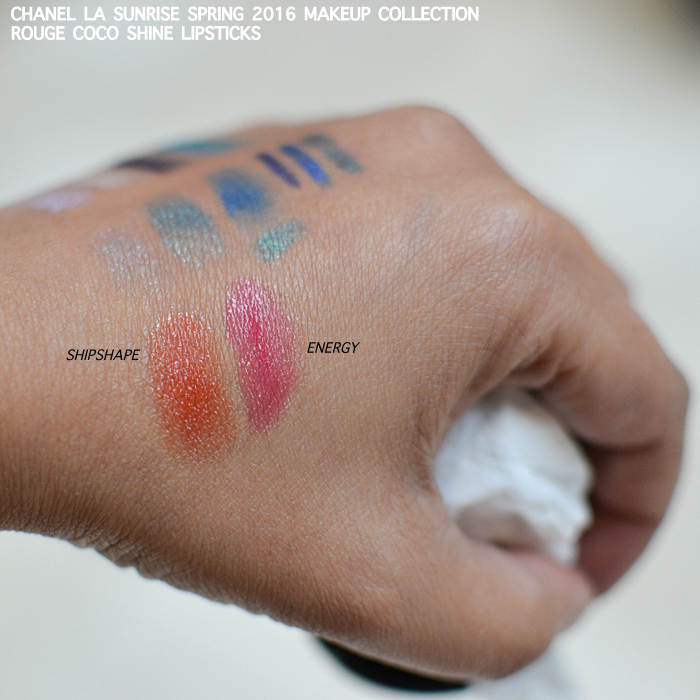 These are among my favorite lipstick formulations, and the new spring 2016 makeup collection includes 3 new shades - Energy, Mighty, and Shipshape. 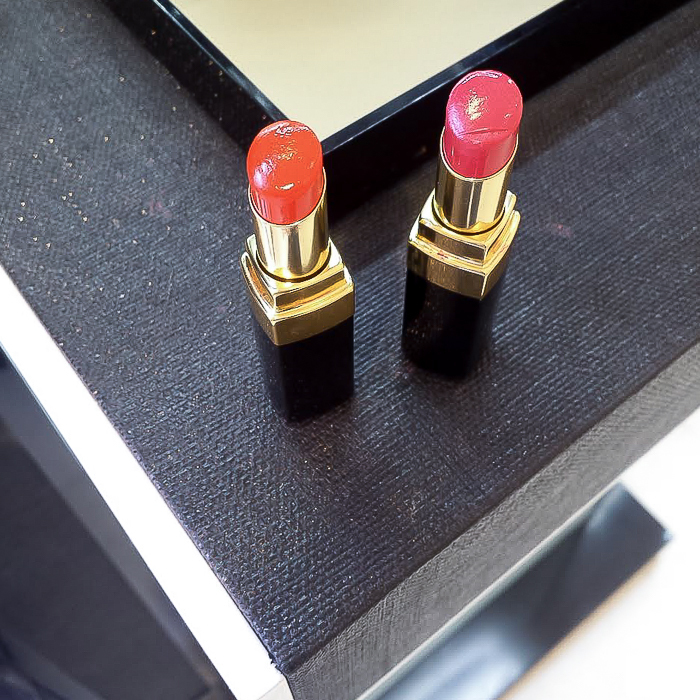 Rouge Coco Shines have a balmy, sheer formula, but these lipsticks do pack quite a bit of color and would show up beautifully even on more pigmented lips like mine. Also included in this collection is a limited edition nail color - Sunrise Trip - a gorgeous deep purple with a glossy shine. 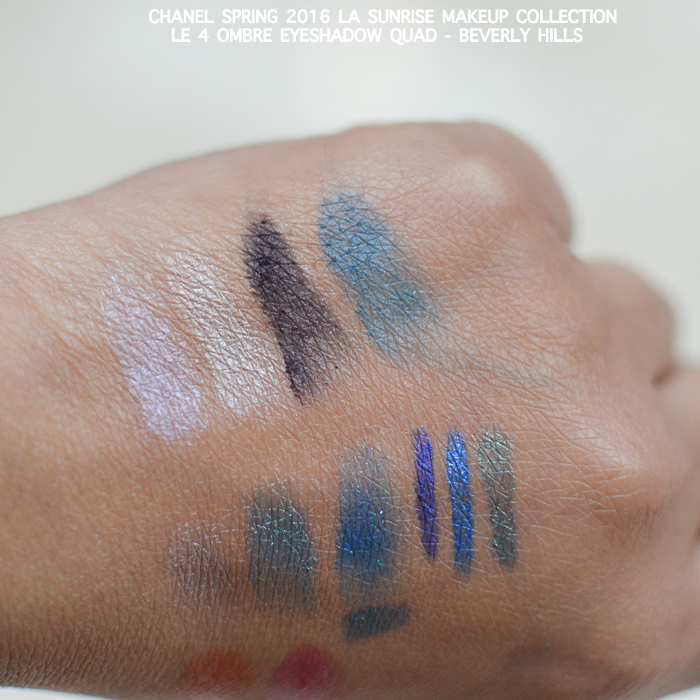 With vibrant blues, deep purples, and bright pinks and corals, Chanel definitely captures the colors of LA in this Spring 2016 makeup collection. My picks would be the Rouge Coco Shines, nail color, and the blush. I don't reach for a lot of blues/greens with my eye makeup, so the eyeliners and cream eyeshadows would be a pass for me. 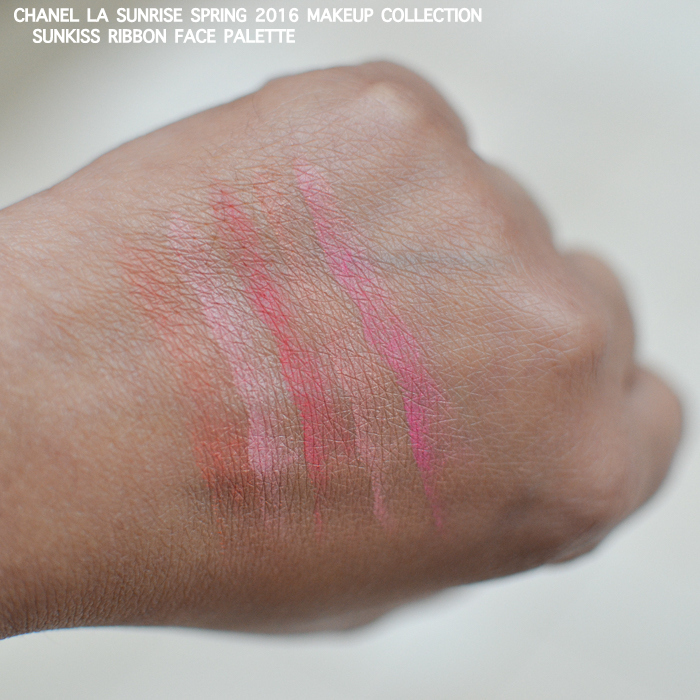 I was super impressed with the pigmentation of the blush when I saw it, too! The quad was not there when I was there, so thank you for the swatches! that purply shade was beyooootiful! Who don't want/require glossy purple on nails?